Education on Federal Employee Benefits"
Depending on when you first come into service as a Federal Employee, you may fall into one of two retirement systems: the Federal Employees Retirement System or the grandfathered Civil Service Retirement System. FERS became effective on January 1, 1987. It replaced CSRS, which had more of a defined-benefit pension structure in its benefits framework. As a modern retirement system, FERS offers a defined-contribution plan along with other benefits. When May I Retire Within FERS? There are other factors that may affect your creditable years of service. Used sick leave, unused sick leave, and distinctions between service as a cilivian versus a member of the uniformed services are among those potential factors. Each type of retirement comes with its years of service rules, minimum age benchmarks, and other eligibility requirements. How Much Will My FERS Benefits Be? Payments from your FERS pension annuity and Social Security will be fixed dollar sums. How much you will get from your TSP will depend on how much you put away in contributions, and how well those funds grew along with how they were managed. In each pay period, the Federal government will take out part of your base pay and allocate it towards your FERS pension annuity. For most employees under FERS, this portion is 0.8% of your base pay. As a defined-benefit vehicle, your pension annuity will give you a basic monthly check of a certain fixed amount for your remaining lifetime. This amount will depend on a number of factors. Like your FERS pension annuity, payments you would receive from Social Security will depend on a few factors. Each pay period, the government takes 6.2% of your basic pay toward Social Security. Your contributions aren’t the basis for your Social Security payments, but rather on your earnings record over time and how long you worked in a job that paid into Social Security. With your TSP, you are able to put in pre-tax contributions as retirement savings. You choose how your money is invested according to investment fund choices within the TSP. Many FERS employees also have a TSP match from the government and their agency of service. Your TSP contributions are completely separate from your FERS pension annuity. For some FERS employees retiring before age 62, a special benefit called the Specialty Annuity Supplement, or also known as the FERS Supplement, may be available. CSRS actually pre-dates the Social Security program, as it was effective on August 1, 1920. If you are a Federal Employee who was hired before January 1, 1984, then you are likely “grandfathered” into CSRS. According to OPM.gov, CSRS is designed as a “defined-benefit, contributory” retirement system. Under CSRS, Federal Employees will be entitled to a basic annuity. Generally, the accumulation of this annuity benefit will be quite larger than that of the basic annuity within the FERS system. As a CSRS participating employee, you will have part of your base pay go towards this retirement system. You may contribute 7%-8% of your pay, and your agency of employment then matches those contributions. You also have the option to increase earned retirement benefits by contributing 10% of your basic pay toward a voluntary contribution account. Alternatively, you may choose to contribute a portion of your pay toward the Thrift Savings Plan Voluntary Contribution Plan, or choose a combination of these two. Under CSRS, your TSP contributions will be tax-deferred, but the government doesn’t match those contributions. Under CSRS, you generally won’t pay any Social Security OASDI tax, but you must pay Medicare tax. When May I Retire Within CSRS? Used and unused sick leave, as well as differences in civilian versus military service, may affect how years of creditable service are calculated. Check with your Federal Benefits counselor for more information relating to your situation. How Much Will My CSRS Retirement Benefits Be? Since CSRS is a “grandfathered” system, your personal numbers may depend on your employment history. Your Federal Benefits counselor can walk you through the steps of calculating benefits projections. That being said, here are some general principles to follow. The basic annuity is based on your length of service and your “High-3” average salary, or the highest average basic pay earned during three consecutive years of service. For all years of service over 10 → First two benchmarks above + 2% of high-3 average salary for each year. The maximum benefit that is receivable is 80% of the high-3 average salary, plus credit for sick leave. Note, though, your annuity may be reduced under certain conditions or circumstances, too. Need Guidance with Maximizing Your Retirement Benefits? Many Federal Employees find their benefits hard to understand or coordinate with the rest of their financial picture. 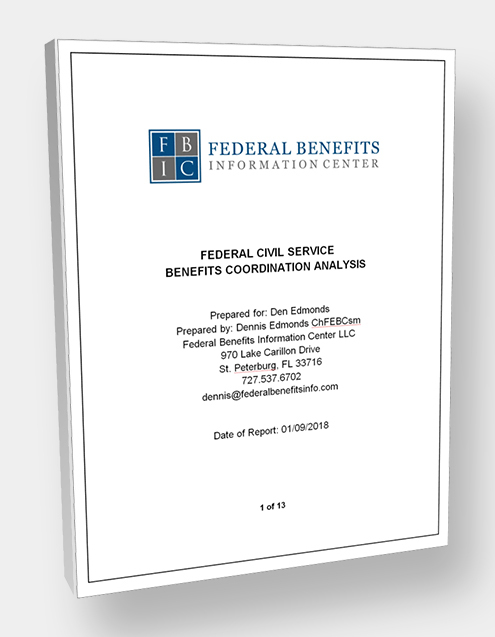 If you could benefit from the guidance of a knowledeable expert in maximizing your benefits, our team at Federal Benefits Information Center can help you. Contact us today or get started with your own no-cost Personal Benefits Analysis. When It Comes to Your Federal Benefits, Numbers Matter. Contact us for a personal consultation or any inquiries about your benefits. What are your concerns?When are my eligible retirement dates with full benefits?How much will my income be when I retire?Why Haven't I received a copy of my Federal Benefits Analysis Before? Request A Free Benefits Analysis And Helpful Information For Your Federal Retirement System! Answer This: Which is Bigger, 2 or 8? Federal Benefits Information Center is not affiliated with, endorsed or sponsored by the U.S. Federal Government. Nor is it affiliated with, endorsed or sponsored by any U.S. Government agency. The material on this website is for informational and educational purposes only. It is not intended to be and should not be understood to be investment, tax or legal advice. Please consult with qualified professionals in these areas regarding your situation. Copyright © 2019 Federal Benefits Information Center. All rights reserved. Designed by Safe Money Broadcasting.